The exact nutritional requirements of caged birds are unknown, in spite of claims to the contrary by some product manufacturers, retailers and breeders. Far too much emphasis has been placed on seed and nut diets for caged birds. They represent a relative-ly nonperishable convenience for bird owners but are a miserably deficient diet for pet birds, especially the larger hookbills. Such diets are excessively rich in oils, extremely deficient in certain vitamins (notably vitamin A), and have an unacceptable calcium to phosphorus ratio. Furthermore, recent research has shown that the high oil content of these food items confers an addictive quality on them. Whenever possible, fruit juice (apple juice is a good starter) should be substituted for the drinking water. As an alternative, Tang (or its equivalent) can be added to the drinking water. This may not be a practical suggestion for birds that habitually bathe in their drinking water. These additives or fruit juices provide more nutrients (vitamins, minerals, etc.) than water alone and they help to mask the taste of other items (vitamins, antibiotics if necessary, etc.) that may be added to the drinking water. Fruit juices that produce stains (for example, grape juice) should not be used. Water to which perishable items have been added or fruit juices must be changed every 12-24 hours and perhaps even more often on especially warm days, to prevent spoilage. Actually, even plain water should be changed with the same frequency for the same reasons. Seeds and seed mixes should not constitute more than 20% of what your bird consumes daily. Animal Protein Sources: Cooked meat (red meat, poultry, fish, etc. ), dog/cat kibble, cooked eggs yolk and white, cheese, cultured milk prod-ucts (cottage cheese, yogurt, etc.). Raw and even pasteurized milk should not be offered because they contain coliform bacteria. Furthermore, many caged birds are sensitive to milk sugar, which is present in milk but not in cultured milk products. Nuts, Trail Mix: In moderation (nuts are rich in oils and fats). Fruits and Vegetables: Fresh, frozen-thawed or canned are all acceptable. Fresh fruits and vege-tables are the most nutritious. Remember: When birds eat a lot of fleshy fruits and vegetables, they excrete excessive fluids in the form of urine which is normal and to be expected. This increased urine in the droppings is polyuria, not :diarrhea! "Junk Food" Items: In moderation. Remember: Salty foods are acceptable for pet birds as long as they are given in moderation and as long as fresh water or fruit juice is always available. The following foods can be prepared and offered to large psittacines (conure, parrot, cockatoo, macaw) on a daily basis. This list has been compiled with consideration to ease of preparation, economy of time, and maximum nutritional value. You should offer at east one item from each of the following food groups daily. Your bird's individual preference for the various cereals may vary somewhat and depend on its body size. Fresh vegetables are most nutritious. Cut up ahead of time and refrigerate in sealed plastic bags or airtight containers. Legumes (peas, beans, etc.) and other dark green and orange vegetables are preferred. Thawed, frozen mixed vegetables (takes min-utes to thaw when added to warm water). Canned vegetables are least nutritious of all choices. Fresh fruit is most nutritious. Cut up ahead of time and refrigerate in sealed plastic bags or airtight containers. Canned fruit is least nutritious of all choices. Every day, offer greens (spinach, broccoli, carrot tops, celery leaves, parsley, etc. ), grated carrot, grated cheese, hard-boiled or scrambled egg, canned tuna fish (packed in water), dry cereals, stale or toasted whole wheat bread (crumbled or in cubes), and small bits of other vegetables and fruits. Some birds may accept soft food items, such as peanut butter, cooked cereals, applesauce, and other strained fruits and vegetables. It is wise to offer pound cake to caged birds of all sizes and get them accustomed to eating it Once your bird begins to accept pound cake, certain liquid medications can be soaked into the cake if necessary. This makes administration of medication much easier n some cases. Vitamin A must be readily available in the diet and consumed in adequate quantities by caged birds to naintain healthy eyes, skin, feathers, and linings of heir gastrointestinal, respiratory and reproductive tracts. 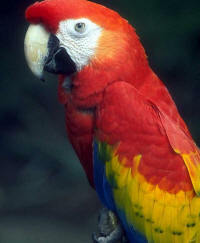 Amazon parrots seem to have the most trouble with vitamin A deficiency. Foods rich in 'vitamin A include cod liver oil, cooked liver, egg yolk, apricots, corn, carrots, squash, sweet potatoes, broccoli, spinach and parsley. Seeds are notoriously deficient in vitamin A.
Caged birds rarely receive enough sunlight and, therefore, rarely benefit from its ultraviolet radiation. Urltraviolet (UV) light is necessary to facilitate certain chemical reactions within the skin that in turn, enable optimal absorption of calcium (necessary for healthy muscles and bones) by the intestinal tract There is zero UV light benefit when sunlight is received through window glass. Consequently, you should take your bird outside on warm, sunny days as often possible. Your bird's wings should be clipped or be bird should be securely confined within a lockable cage. Make certain that neighborhood cats and wild birds are prevented access to your bird. It also important for you to provide areas of sunlight and shade for your bird so that it can move into the Lade if it becomes too warm. Many bird owners use artificial UV light sources replace the regular incandescent and fluorescent light bulbs in the rooms in which their birds are housed. The most popular and recommended light source of this type is the Vita-Lite (Duro-Lite Lamps, Duro-Test Corp., Lyndhurst, NJ 07071). The subject of bacterial contamination of food and water for caged birds is rather controversial. Many apparently healthy caged birds harbor potentially harmful bacteria within their intestinal tracts. These organisms can create illness during periods of stress (short or long-standing) for your bird. Many veterinarians agree that Gram-negative bacteria (coliform type) can contaminate seeds, seed dishes, unwashed fruits and vegetables, and even tap water. Consequently, it may be advisable to bake or microwave seeds and seed mixes (spread seeds to a depth of 1 inch in a Pyrex dish and bake at 350 F for minutes, stirring once, or microwave on high set for 5 minutes). This seems to eliminate these potentially harmful bacteria without compromising 'nutritional value of the seed. The skins of all fruits and vegetables should be thoroughly washed before being offered to your bird. One study clearly demonstrated that colony counts of potentially harmful bacteria in tap water samples could be greatly reduced by allowing the tap to run for at least 3 minutes before the water cup was filled. Offering bottled water is probably an acceptable alternative, though bottled water dispensers occasionally harbor disease carrying bacteria. The spigot should be opened a few seconds and water al-lowed to run before filling the water container. The recommendations mentioned above should help you to offer the correct foods, but there is no guarantee that your pet bird will accept and consume any or all of them.